Normally, I am a night owl and I have a much better appetite at night than I do in the morning and early afternoon. However, when I went online to compare Kyo's all-you-can-eat lunch and dinner menus, I noticed that the lunch menu contained pretty much everything I wanted to try from the dinner menu. Furthermore, the lunch menu ($17.95) is $10 cheaper! If you pay me $10 to wake up early for once, I'd happily do it. Note the word "once". 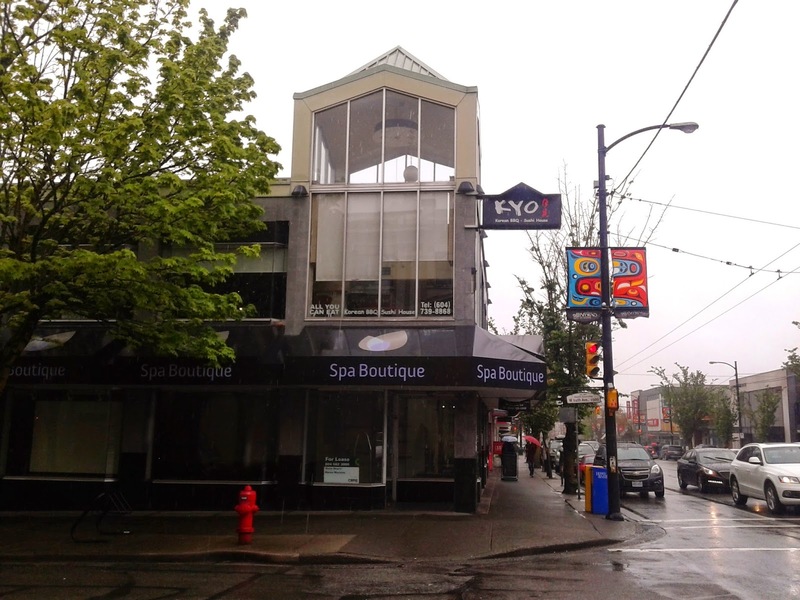 Kyo is a Chinese-operated Japanese all-you-can-eat restaurant that serves Korean BBQ as well. (Doesn't it seem like every Japanese all-you-can-eat restaurant is Chinese-operated?) The restaurant is located on the second floor so you get to walk up these huge, majestic stairs in order to get to the dining area. Mmm, exercise... The dining area was quite grandiose and everything looked clean and modern, except for the fact that the leather seats had huge rips in them. Did someone accidentally let the cats loose or something? One of my favourite Japanese dishes is Goma-ae, so I ordered it right off the bat. 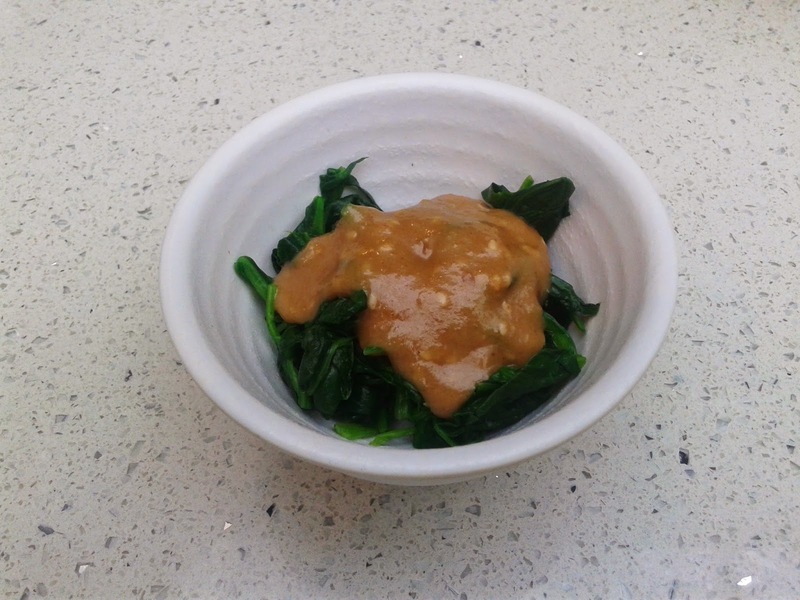 They got the temperature right, but it would be nice if the peanut butter sauce was mixed in more with the spinach, and if there was a bit more of the sauce. It was passable though. 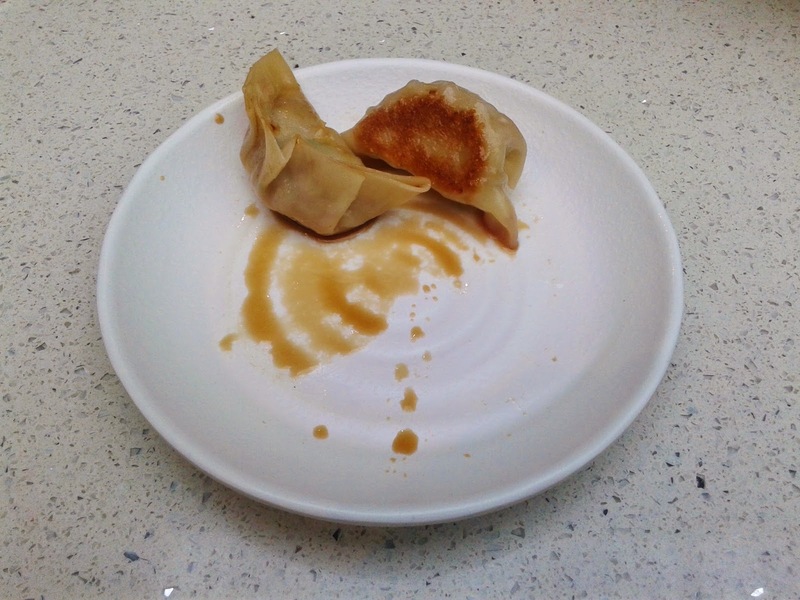 Next came the Pork Gyoza, and as you can see above, the gyoza were beautifully arranged on one side of the plate. The filling was sufficiently juicy, and the amount of vinegar was about right. There were a few parts of the crust that were slightly hardened. 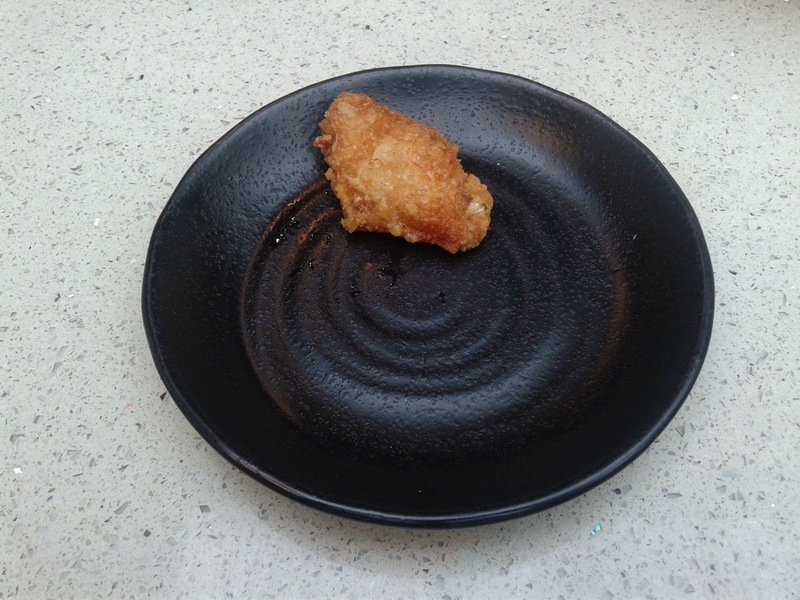 The Chicken Wing had a nice crispy exterior, and had a sufficient amount of moisture. I wouldn't mind ordering more of these if I had the appetite of a guy who actually exercises. 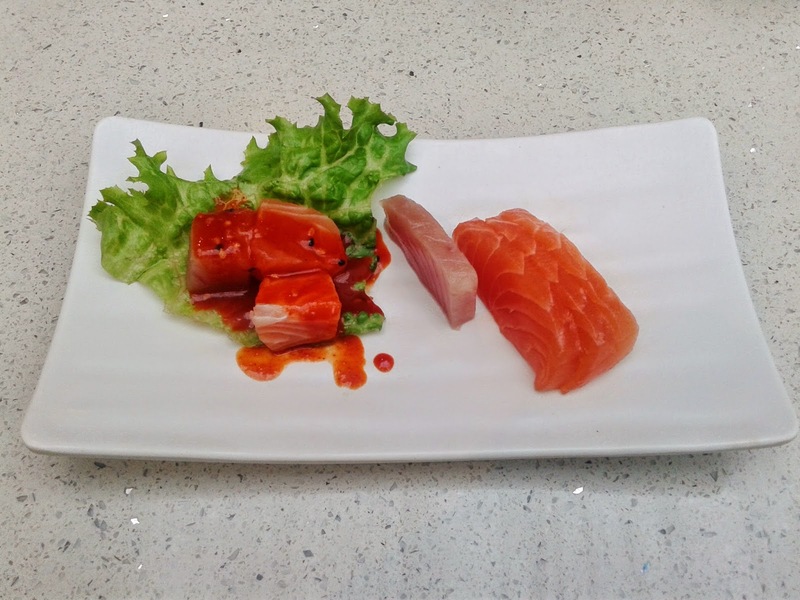 You are allowed to order up to 8 pieces of sashimi in the all-you-can-eat lunch menu. Unfortunately, the only word I can think of to describe the size of the pieces of sashimi is "adorable". To maximize the surprise, they also forgot one of the pieces of tuna. This was really a shame because the "mini sashimi" was actually quite good. I asked the server for my missing piece of tuna, and she apologized and quickly gave it to me. The Inari Nigiri was sufficiently soft with a decent amount of sweetness. The Chopped Scallop Nigiri was a bit heavy on the mayonnaise, but had the right amount of rice underneath. The Aburi Tuna Nigiri with Miso Sauce had a delicious seared flavour and soft texture, and so did the Aburi Salmon Nigiri with Miso Sauce. The nigiri had by far the best fish-to-rice ratio out of any all-you-can-eat restaurant I have ever been to. 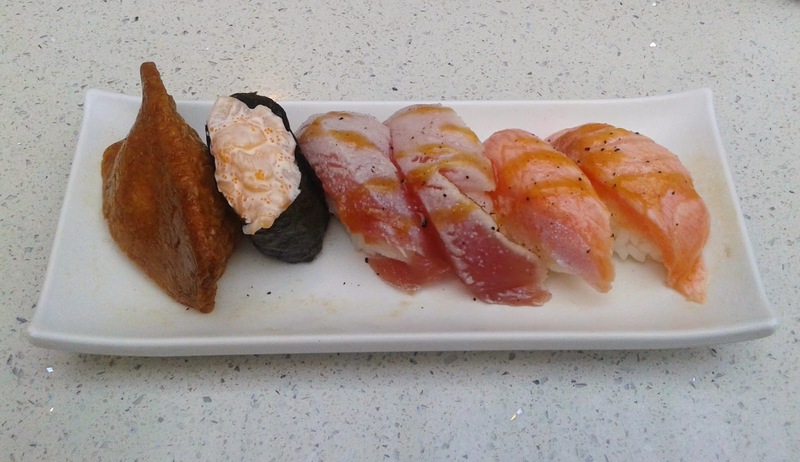 Since the Aburi Salmon Nigiri was better than the ones in many other restaurants I've been to, I decided to order a few more pieces of it towards the end of the meal. Whereas the sashimi came in miniscule portions, the BBQ meat came in huge portions - 5 pieces per order! I succumbed to my natural instinct of wanting to try everything, so I put a "1" beside every type of BBQ meat on the order form. Oops, I think that's like 20 servings of meat in one meal. Oh well, I'm not Dr. Oz, so I'm not legally required to follow the food guide, right? As expected, the BBQ Beef wasn't very bulgogi-like, but you don't have to cook it for long. 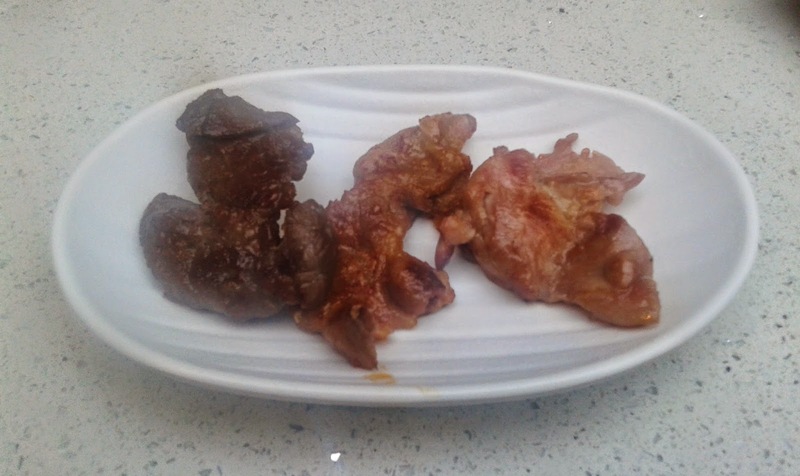 Two of the pieces were basically unchewable, but fortunately, they don't charge extra for two pieces of leftover chewed-up meat. (Don't try to picture that!) The BBQ Spicy Pork had a good level of spiciness, and the BBQ Chicken was the best, being both tender and juicy. The BBQ Chicken is also the hardest to cook correctly. The BC Roll came with grilled salmon skin, lettuce, and a 1 cm. drip of teriyaki sauce off to the side. The crunchiness came from the lettuce rather than the grilled salmon skin, but at least they tried. 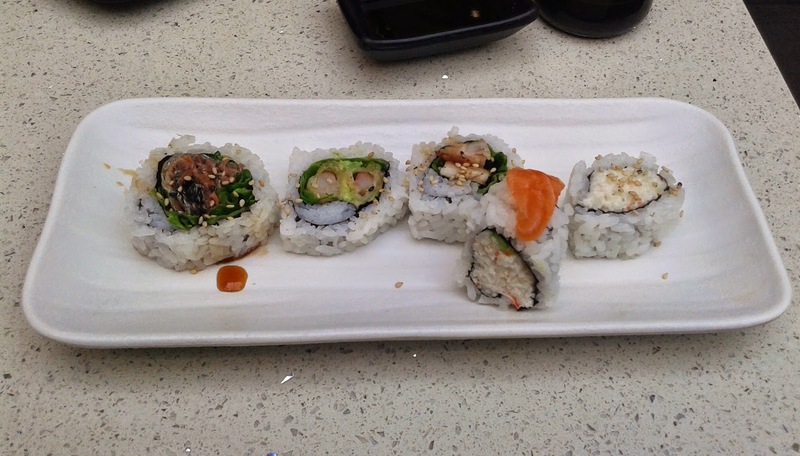 In the Dynamite Roll, the crunchiness also came from the lettuce, but the prawn had a good snap to it. The Beef Teriyaki Roll that I ordered somehow turned into a Chicken Teriyaki Roll with some rather hard chunks of chicken inside. I guess it's possible that I ticked the wrong box, but I'm 70% sure that I didn't. The Alaska Roll had a nice but tiny piece of salmon on top, and like the California Roll, there was way too much mayonnaise with the crab meat inside. 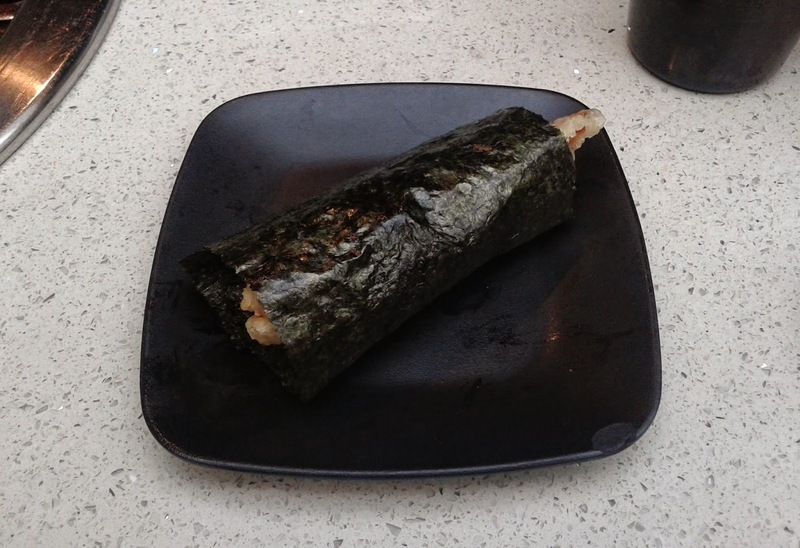 I enjoyed the prawn tempura in the Prawn Tempura Cone, which was garnished with a small amount of mayonnaise. The seaweed was a bit hard in places, but I think the real struggle for them was trying to not make the cone turn into a cylinder. 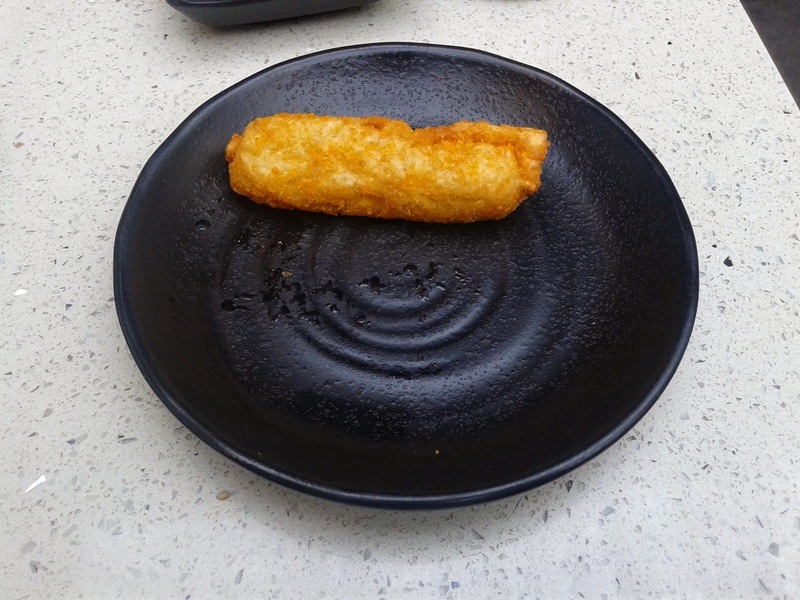 Alternatively, they could just call it a "Prawn Tempura Cylinder" on the menu. I'm sure people will try it out of curiosity. 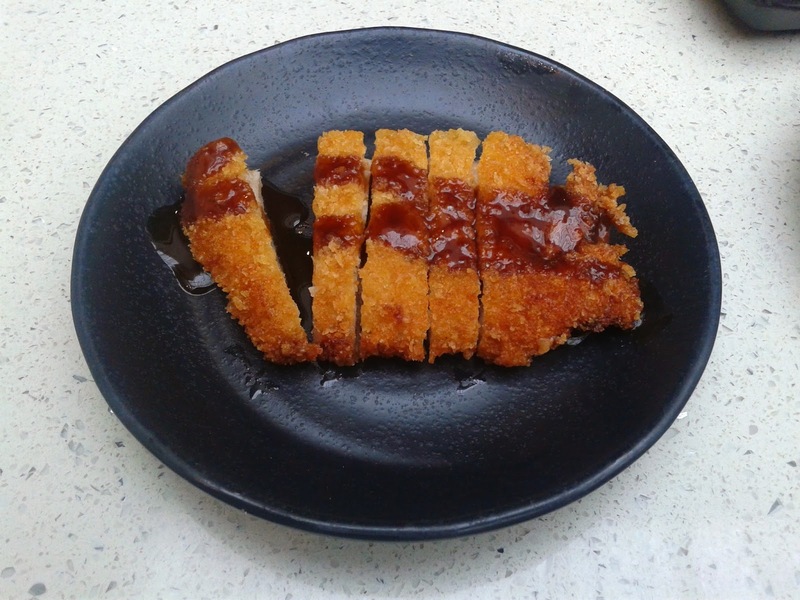 The Tonkatsu (breaded deep-fried pork cutlet) had some very crunchy panko batter on it, and was dressed with a tangy Worcestershire sauce. Although the batter was a little hard in places, the pork was sufficiently tender. If you want a nice teeth workout, you can try the Deep Fried Mochi. It has a sticky interior and a sweet flavour. It is interesting how the whole thing looks like batter once you take a bite out of it because the mochi and the batter are pretty much the same colour. Since the BBQ Chicken tasted quite decent, I decided to try out the Chicken Teriyaki. The chicken was tender and the skin had some crispiness. 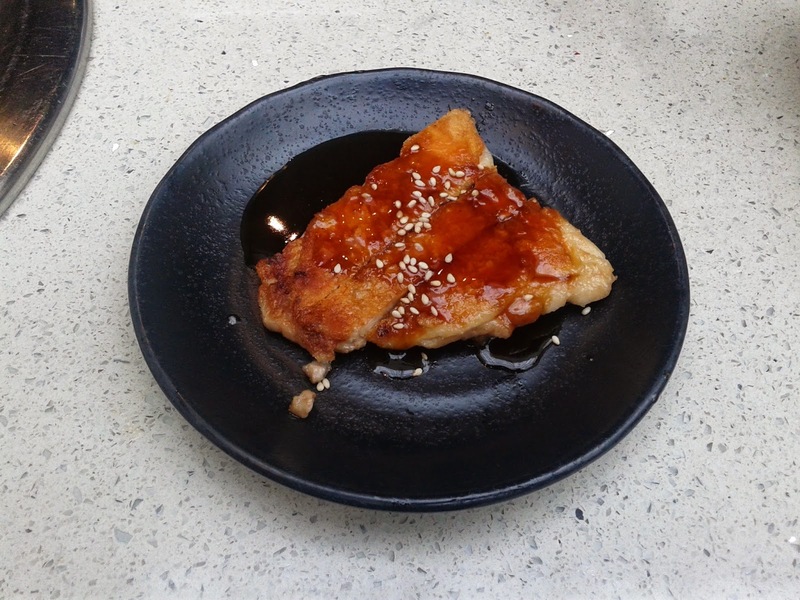 The teriyaki sauce somehow absorbed the flavour of the sesame seeds. I was way too full from eating 20 servings of meat, so I asked the server for half an order of Fruit Jello since I don't like to waste food. 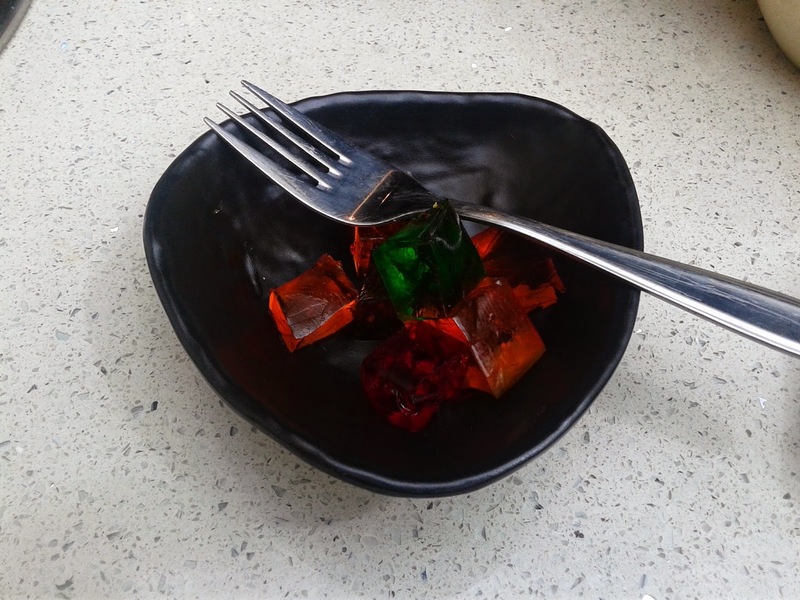 I liked the variety of flavours in the jello and I enjoyed the jello itself even though it was just standard jello. I really should have asked the servers if I could also have half orders of the BBQ meats, or if I could have half a California Roll. There wasn't really much in terms of service, and most of the dishes were simply placed on my table without a word. However, the servers fulfilled all of my requests in a timely matter, so I'll give them that. Most of the food was average for an all-you-can-eat, but a few items stood out to me, such as the sashimi, the BBQ Chicken, and the Aburi nigiri. I did get a sore throat from the overdose of BBQ meat, but I wouldn't mind coming back for some all-you-can-eat Aburi nigiri sushi!